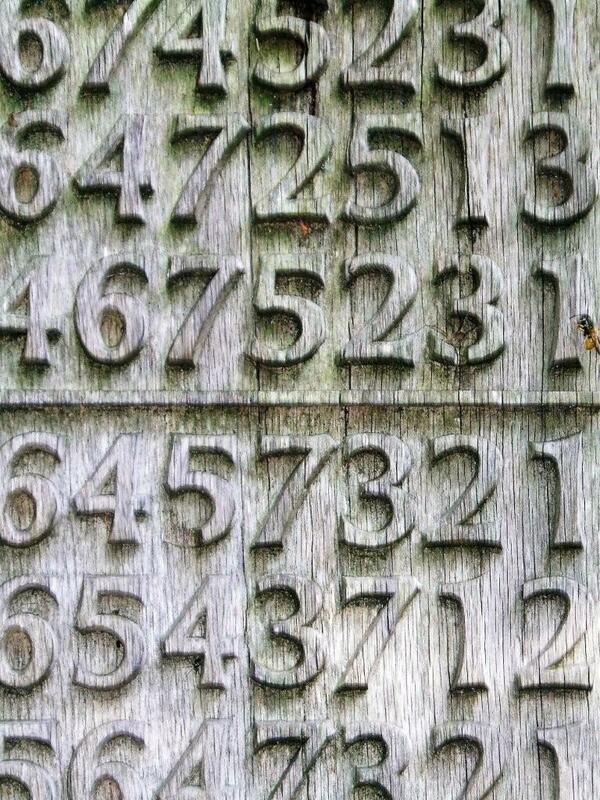 ‘Foxgloves’ 1996 (detail): Sculpture by Ian Hamilton Finlay and Peter Coates, Durham Botanical Garden. The numbers represent a bell-ringing sequence, as well as referencing the bells of the familiar flower. Two British artists have achieved particular influence in the world of landscape design in the second half of the twentieth century: Ian Hamilton Finlay and Derek Jarman. Both worked on a relatively intimate scale – gardeners rather than park-makers – and both left a lasting legacy, still being developed and explored. A small, but fascinating exhibition of Finlay’s work is currently on show at Kettle’s Yard in Cambridge until 1 March 2015. Devised by Professor Stephen Bann, a friend and lifelong cataloguer of Finlay’s work, this selection is taken entirely from Bann’s own private collection. Finlay’s early work belonged to the world of concrete poetry, an artistic form first popularised in Brazil. Some of this was exhibited at an international exhibition of concrete poetry at the Brighton Festival in 1967, where I first saw it, and it made an immediate impact. Word puns, elegant typography, and a print-making technique based on picture-book style images and words created a child-like wonder at the connection between words and things in Finlay’s subsequent work. The tension between pictures and labels, images and text, was also at the heart of linguistic philosophy in the twentieth century, and Finlay sometimes described himself as a philosopher-poet rather than an artist (though in his later years he became, for me, an artist-gardener). Finlay’s graphic work was often published in small press editions, beautifully designed and printed. The world of small presses and craft book production which he and other concrete poets espoused – a slow-burning fuse in a burgeoning popular culture of signs and representations – seems a far cry from the bad lettering (and therefore bad faith) of much later Brit-Art. For Finlay the alphabet was a sacred repository of human creativity and meaning, and he said he liked to ‘roam’ amongst the letters of the alphabet, as others like to roam in the fields and woods. The late and much-missed art critic, Tom Lubbock, once summarised Finlay’s ouvre as embodying a ‘tragic conception of politics, where idealism and catastrophe are inextricable.’ A further pre-occupation was with the emblems and insignia of the Third Reich. Many people found this latter fascination even more difficult to come to terms with, and his reputation suffered as a result. This was something he wasn’t really prepared to discuss, as he saw it as well within the bounds of artistic exploration. We are perhaps today becoming more used to what is involved in the iconography of terror. For personal reasons Finlay remains special to me because, in 1996, I went to interview him at his isolated house and garden, Little Sparta, at Stonypath in the Scottish borders, for a book I was writing about memorial landscapes. It was an exceptionally cold January afternoon, and many smaller roads were snow-bound. The walk from the hired car took me across several fields, the paths and ditches of which had been obliterated by snow, so much so that I was worried I might lose all sense of orientation in the entirely white landscape, with night coming on. The return walk in total darkness was even worse. Finlay was thoughtful, serious and kind on this one occasion that I met him, though he employed a vocabulary of politics and art that was entirely foreign to me then, less so now. Central to this vocabulary was the notion of piety. For Finlay, as for Edmund Burke before him, the sublime was an unnerving admixture of beauty, order and terror, and not for the faint-hearted nor the corporate piazza. The emphasis on piety reminded me of a claim made by some environmentalists that people only respect landscapes which contain a significant element of danger. Since the English landscape mostly lacks these things, other means of inducing a degree of fear and trembling might be needed or sought: melancholy inscription, admonitory messages of life’s brevity. Some find this in churchyards and cemeteries. Et in Arcadia Ego. This I think was Finlay’s great and original achievement: the re-inscription of the landscape.